Reliability — How's the Ride? Whether or not transit vehicles arrive at a given destination close to a schedule time or headway is the quality of transit service known as reliability. Traditionally, reliability is measured by on-time performance. There is wide agreement that reliability is one of the most important elements for great transit. CityLink Blue Headways: Observed headway intervals for the CityLink Blue line at Bus Stop 3285 (Security & Woodlawn) between 3:10-5:10PM on August 24, 2017. Observed by Transportation Alliance staff. CityLink 100 Day Summary: 100-day summary of on-time performance for CityLink frequent routes, where an on-time bus arrives within 5 minutes of its advertised headway. Reported by MTA in BaltimoreLINK 100 Day Report. LocalLink August 2017 Summary: Summary of observed LocalLink on time performance data for routes 61, 51, 95, 37, 79, 31, and 71 during August 2017. Observations made by Transportation Alliance staff and volunteers. When the Transportation Alliance's Rate Your Ride survey asked riders what the number one problem with their transit ride was, by far the most common response was that the bus is often late or does not show up at all. MTA reports on-time performance quarterly on its Performance Improvement website. Headway Management (new for CityLink): For CityLink frequent routes (operating 7am-7pm on weekdays), MTA measures how buses maintain their advertised headways to determine whether each bus is on time. Buses must arrive within 5 minutes of their advertised headway. This means that if headways are advertised to be 10 minutes, each bus must come within 10-15 minutes of the previous bus. Early buses, and buses that arrive 6 or more minutes later than the advertised headway are not on time. Traditional Schedule Adherence: For CityLink buses that are not operating on frequent scheduling, and for all LocalLink buses, MTA uses a more traditional schedule adherence approach to measure on-time performance. This approach measures bus arrival time from a scheduled timepoint, i.e., a specific scheduled time for a specific point along a route. If the bus is more than 1 minute early or more than 5 minutes late, the bus is considered to be not on time. Buses that are within the 1 minute early-5 minutes late parameter are counted as on time. The MTA does not include "cut runs" in its on-time performance statistics. This means that if a particular bus is effectively cancelled, because of an equipment shortage, driver absence, or other contingency, it will simply not be counted at all and therefore not be represented in the officially reported on-time performance statistics. MTA also has traditionally measured system endpoints to calculate its on-time performance statistics. In other words, when MTA says that a route is 80% on time, it means that of a set of surveyed buses, 80% of them arrived at the end of their route within the on-time performance window of 1 minute early or 6 minutes late. To better measure reliability, we need the outdated bus locator hardware to be replaced by modern GPS units, a step that MTA is actively working on. However, better data is just the beginning for improving how we measure and report reliability in our public transportation system. MTA should count its cut runs when measuring and reporting reliability. When runs are cut, riders have to wait for the next scheduled bus. From the experience of the rider, this is the same as if their scheduled bus is very late. If the next bus comes exactly on time, the rider who's bus is cut has waited 10, 20, 30 minutes or more for their scheduled bus, and for reliability statistics to ignore that rider experience does everyone a disservice. The way MTA currently reports real-time data is to give aggregate numbers. 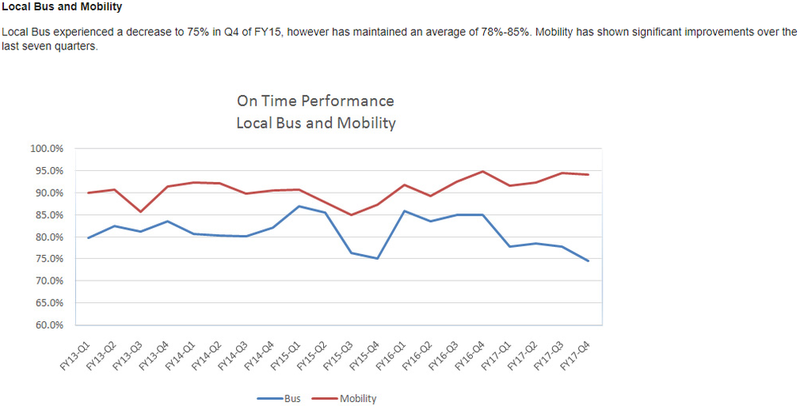 The quarterly report it publishes provides a single on-time performance number for all bus service. In the BaltimoreLink 100 Day Report, MTA released a single on-time performance number for CityLink buses only. By contrast, when the Baltimore Metropolitan Council issued its report, "The Transit Question," it was able to obtain from MTA a summary table of on-time performance by route (see Appendix I of the report). This report, for perhaps the first time, showed the public how overall system on-time performance percentage was distributed across MTA's various routes. Since riders experience the bus system one route at a time, this level of specificity is much more relevant to riders. Similarly, any decision-maker seeking to improve reliability in the system must understand how reliability varies across different routes.